We all know how difficult it can be to feed a good doer and it can be even harder if that good doer is pregnant or has a foal at foot. It can be a very delicate balancing act to get it right for both mare and foal – and balance is exactly what you’re looking for! A balanced diet is vital for supporting growth and development – it’s just the energy (calories) that aren’t required. The last trimester is when the majority of foetal growth will occur but a balanced diet throughout pregnancy is advisable. As with humans, being overweight during pregnancy may affect the metabolism of the foal later in life which is why it’s important to try and keep weight off the mare if possible. 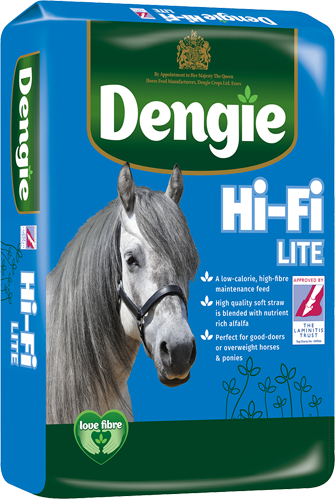 Quality fibre feeds such as Dengie Hi Fi Lite and Hi Fi Molasses Free provide a good source of fibre along with naturally occurring vitamins and minerals such as calcium. Feeding a comprehensive broad spectrum vitamin and mineral supplement alongside will mean that your mare receives a quality balanced diet, with no excess calories. Dengie Performance Vits and Mins would be ideal! 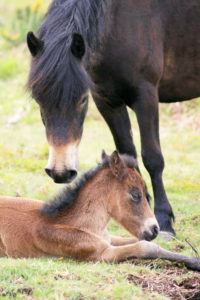 During the third trimester however, the increased growth of the foal will cause the mare to gain weight, but remember – this should only be an increase of about 15%. So that means that a 500kg mare would only gain up to 75kgs. If you weigh her using a weighbridge and you see a higher level of weight gain it means she is putting on weight rather than just the growth of the foal and you may want to take action to make sure she isn’t getting too fat. During pregnancy the foetus accumulates mineral stores which the foal will utilise once it is born and growing very rapidly. It is essential that the mare receives a balanced diet, with the correct levels of vitamins and minerals to meet her energy requirements. It is tempting to introduce a Stud Mix or Cube as they are the obvious choice and are often recommended by feed companies and other breeders. However, good doers are often fed less than recommended amounts of these feeds as they don’t need the energy they provide but this means the mare will miss out on important vitamins and minerals such as copper, which can be harmful to the growth and development of the foal. Alternatives include Stud Balancers which provide essential nutrients but without the calories of traditional stud feeds. Alfalfa is abundant in calcium and provides quality protein too making it ideal for breeding and youngstock. The Dengie Alfa-A range can be a safer way to provide additional energy if it is required for mares that have a history of laminitis or that require a low starch ration for other reasons. An Alfa-A product, such as Alfa-A Original will provide around 10 times less starch than a stud mix or cube whilst still supplying a great source of quality protein. The calcium in alfalfa also helps to buffer acidity in the digestive tract so is particularly useful for mares that have gastric ulcers. Lactation places significantly higher nutrient and energy demands on the mare; the energy requirement increases by 90% compared to that of a barren mare! A 500kg mare will need to produce between 10 and 17.5kg of milk during the first few months of lactation and this can be a good time for an overweight mare to use some of her energy reserves! Don’t be tempted to over-feed her if she is overweight – keep supplying the vitamins and minerals so she can pass them to the foal through her milk and monitor her condition. If you think she has lost too much weight then the energy level can be increased. 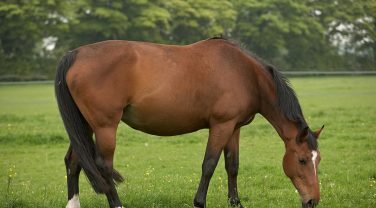 A leaner mare is likely to be easier to get back in foal and will be at less risk of other issues so it is better to use the opportunity to achieve weight loss if you can! 350kg Native Pony mare, pregnant and living out. 90 g of Performance Vits and Mins, 250gms of Hi-Fi Lite to mix the supplement in. 650kgs Warmblood Mare, foal at foot, out on good grass during the day, ad lib hay overnight when stabled. Has had laminitis in the past, reasonably good doer. 2kgs Alfa-A Oil, 650 grams of Performance+ Balancer. For further advice and guidance on what to feed your mare please contact the Dengie Feedline on 0845 345 5115* or send us an email. Dengie senior nutritionist Katie Williams, MSc (Dist), provides some handy advice to help keep your mare in blooming good health and in the best shape possible during her pregnancy.